ORCID number: Wen-Hua Xue (0000-0003-4045-8166); Zhi-Rui Fan (0000-0002-0389-5271); Li-Feng Li (0000-0002-7492-4017); Jing-Li Lu (0000-0002-4777-8368); Bing-Jun Ma (0000-0002-8275-2120); Jie Zhao (0000-0003-1168-8384); Quan-Cheng Kan (0000-0002-2998-4918). To explore the expression profiles of microRNAs (miRNAs), long non-coding RNAs (lncRNAs), and mRNAs in oesophageal squamous cell carcinoma (ESCC) in order to construct an oesophageal cancer-specific competing endogenous RNA (ceRNA) network. In this work, the expression data of miRNAs, lncRNAs, and mRNAs in ESCC were obtained. An oesophageal cancer-specific ceRNA network was then constructed and investigated. CeRNAs have the ability to reduce the targeting activity of miRNAs, leading to the de-repression of specific mRNAs with common miRNA response elements. CeRNA interactions have a critical effect in gene regulation and cancer development. This study suggests a novel perspective on potential oesophageal cancer mechanisms as well as novel pathways for modulating ceRNA networks for treating cancers. Core tip: Competing endogenous RNAs (ceRNAs) may play a critical role in tumourigenesis, and perturbations to ceRNA networks would result in the progression of oesophageal squamous cell carcinoma (ESCC). However, the role of ceRNAs in ESCC has not been comprehensively explored. 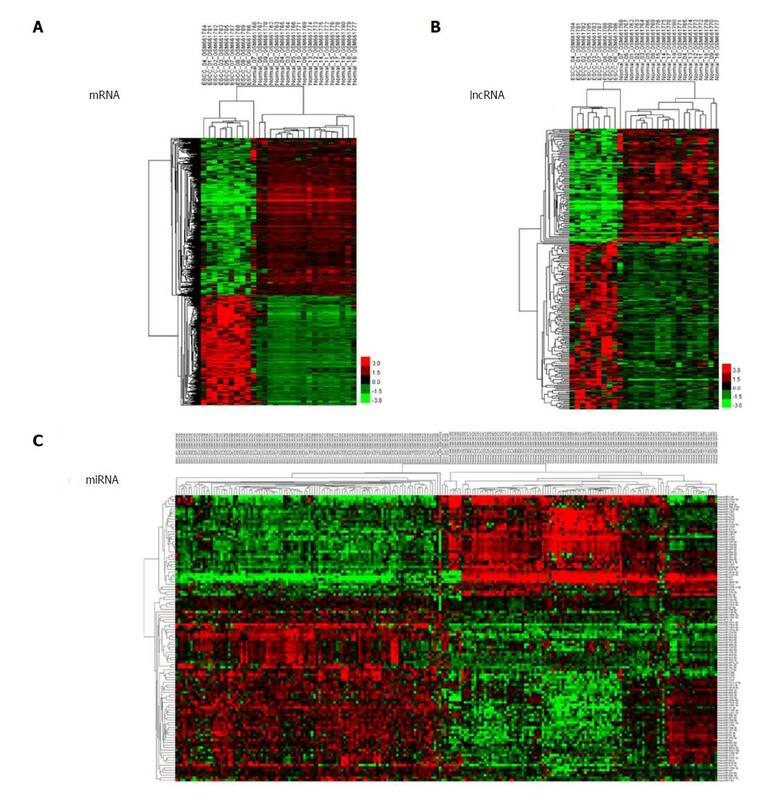 This study was designed to investigate the expression profiles of microRNAs, long non-coding RNAs, and mRNAs in ESCC to elucidate an oesophageal cancer-specific ceRNA network. Our report reveals potential molecular mechanisms of oesophageal cancer progression and suggests a novel approach to cancer therapeutics in the regulation of ceRNA networks. Oesophageal squamous cell carcinoma (ESCC) is the sixth leading death reason of cancer. According to the official statistics in America, more than 18000 cases were newly diagnosed with 15000 deaths from oesophageal cancer in 2014, representing 5% of all cancer deaths. Recently, the incidence and mortality rate of ESCC have decreased in North America and Europe. However, ESCC has a significant ethnic and geographic distribution and it has been highly prevalent in China and other Asia countries. The presence of familial aggregation suggests that the risk factors for ESCC include environmental and genetic factors. When ESCC is diagnosed, most patients have already progressed to be advanced or metastatic. Thus, as there is no longer an opportunity for radical surgery, radiation and chemotherapy become the major palliative treatments. Tumourigenesis and cancer development have been closely associated with the aberrant expression of protein coding mRNAs and non-coding RNAs. Approximately 98% of the human genome are non-coding RNAs, suggesting their promising effects on physiological and pathological processes. MicroRNAs (miRNAs) suppress the translation and induces the degradation of mRNA, thus modulating gene expression and function. MiRNAs have been proved to have critical effects in tumourigenesis, and the role of miRNAs has been relatively well understood. Long non-coding RNAs (lncRNAs) are newly found non-coding RNAs which were proved to participate in many diseases. However, the functional role of the large number of lncRNAs in ESCC remains unclear. Many studies have confirmed that competing endogenous RNAs (ceRNAs) are able to act as sponges for miRNAs. The activity of miRNAs could be modulated with the variation of ceRNA abundance from individual genes. Interactions between ceRNAs through sharing miRNAs indicate a new pathway of gene regulation, which has key effects in the cancer progression[12-14]. CeRNAs act as molecular sponges of miRNAs through binding with miRNAs (also known as miRNA response elements, MRE), thus inhibiting miRNA targeted genes. The discovery of ceRNAs requires reassessing our understanding of gene regulatory networks and raising the probability of proposing a new molecular mechanism. Both of them may be the potential targets for gene treatment[16-18]. Lately, complex and multidimensional molecular maps of large cancer crowd were uncovered by research alliance such as The Cancer Genome Atlas (TCGA). With these information, a synthetic analysis could be performed on the association between molecular alterations and certain cancer type[19-21]. Many ceRNAs were revealed in various cancer types. Until now, few studies have been performed on clarifying the association among lncRNAs, miRNAs, and mRNAs in ESCC. Therefore, in this study, a ceRNA network in ESCC was constructed, which may help to elucidate the specific biological mechanisms of ESCC progression. The expression data of miRNAs and mRNAs in 101 oesophageal cancer patients were collected from the National Center for Biotechnology Information Gene Expression Omnibus (NCBI) with login numbers of GSE45670 (38 patients, http://www.ncbi.nlm.nih.gov/geo/query/acc.cgi?acc =GSE45670), GSE26886 (28 patients, http://www.ncbi.nlm.nih.Gov/geo/query/acc.cgi?acc =GSE26886), GSE17351 (10 samples, http://www.ncbi.nlm.nih.gov/geo/query/acc.cgi?acc =GSE17351), GSE55856 (216 patients, http://www.ncbi.nlm.nih.gov/geo/query/acc.cgi?acc =GSE55856), and GSE66274 (60 patients, http://www.ncbi.nlm.nih.Gov/geo/query/acc.cgi?acc =GSE66274). Various miRNA targets and oesophageal cancer data sets were also applied for assessing the reliability of this approach, aimed to construct a ceRNA network. Under these circumstances, we also implanted the expression profiles of 170 matched miRNAs and mRNAs in oesophageal cancer patients from TCGA. Annotation information of lncRNAs was obtained with Affymetrix Human Genome U133 Plus 2.0 arrays. The network of protein-protein interactions was constructed using STRING database system. DAVID (Databases for Annotation, Visualization and Integrated Discovery) was included to determine the pathways of KEGG (Kyoto Encyclopedia of Genes and Genomes) and Gene Ontology (GO) Term biological processes were enriched with central genes recommunities in the ceRNA network. P values < 0.05 indicated enriched gene sets. The miRNA-lncRNA-mRNA interaction network was visualised with Cytoscape Software, and topology analysis was performed with network analyser plugin. MCODE plugin was also applied (with its default parameters) to figure out the communities (dense clusters) in the network. The single-stranded miRNAs would bind the mRNA transcripts, thus the post-transcriptional regulation of mRNA has been set up according to the relationships among miRNAs, lncRNAs, and mRNAs[29,30]. First, the miRNAs, lncRNAs, and mRNAs which were differentially expressed between ESCC specimens and corresponding normal tissues were chosen. The differential expression of miRNAs, lncRNAs, and mRNAs was identified with standard selection criteria, which were set at P < 0.05 and fold change > 2. In addition, the co-expression network of miRNAs, lncRNAs, and mRNAs was constructed according to the connections among the differentially expressed miRNAs, lncRNAs, and mRNAs. Data are expressed as the mean ± SD. Student’s t-test and analysis of variance were applied in the statistical analysis for comparing results of two groups and multiple groups, respectively. The fold change and Student’s t-test were applied to analyse the significance of microarray analysis. P < 0.05 indicated a statistically significant difference. P value was corrected with false discovery rate. The differentially expressed lncRNAs, miRNAs, and mRNAs are expressed as fold change values (P < 0.05). We used unsupervised hierarchical clustering analysis in this study. Cases were organized by clustering analysis on the basis of immunostaining profiles, and cases were placed together with similar immune profiles as neighbouring rows in a clustergram. The dendrogram was applied to demonstrate the relationship among cases and immune markers. The branch length of dendrogram indicated the correlations in immunostaining results. The unsupervised hierarchical cluster analysis demonstrated the correlation of expression maps between biological replicates and group conditions (Figure 1A-C). Figure 1 Cluster analysis of differentially expressed profiles. A: mRNAs; B: lncRNAs; and C: miRNAs in tumour tissues vs adjacent non-tumour tissues. The result of hierarchical cluster analysis shows distinguishable expression profiles between samples. The rows show differentially expressed miRNAs, lncRNAs, and mRNAs, while the columns show three paired samples. Red represents high expression and green represents low expression. The inter-connected complexity of physiological, cellular, and molecular functions has increasingly grown, thus novel approaches are required to simultaneously demonstrate multiple datasets. There are multiple intersecting regions (generally as circles) in Venn diagram, which enables the description of all logical relations among various data sets. Here, we selected 21 miRNAs from GSE66274 and GSE55856; 228 mRNAs from GSE26886, GSE17351, and GSE45670; and 31 lncRNAs from GSE26886, GSE17351, and GSE45670 (Figure 2A-C). Figure 2 Venn diagram analysis of differentially expressed genes in comparison groups. A: miRNAs; B: mRNAs; C: lncRNAs. In the GO database, there are structured, controlled vocabularies and classifications covering several molecular and cellular biology domains. GO has been applied for the annotation of genes and sequences. The 228 genes with differential expression were analysed with the GO database. The enrichment of these genes was analysed in specific pathways. Enrichment analysis is used to evaluate the significance of the function, which helps provide GO terms with a more definitive function demonstration. As shown in Table 1, the most highly enriched GO path was ‘extracellular matrix organization’. The genes in ‘extracellular matrix organization’ path were MMP3, MMP10, LAMA3, MMP9, MMP13, COL11A1, BMP7, MMP12, LAMC2, COL27A1, ITGB4, PDGFRA, ADAMTS2, IBSP, COL10A1, COL7A1, MMP11, MFAP2, MMP1, and COL1A1. The second most highly enriched GO path was ‘collagen catabolic process’ (Figure 3). Table 1 mRNA GO analysis in oesophageal squamous cell carcinoma. 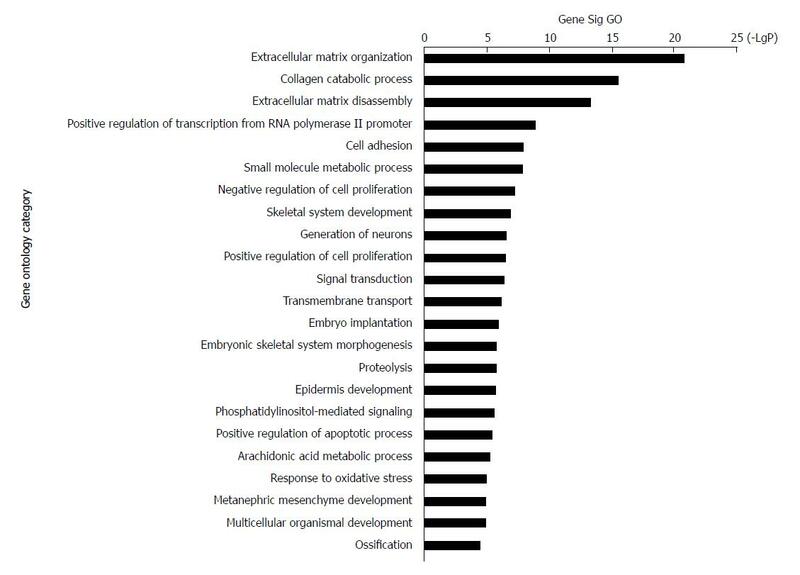 Figure 3 Top 23 GO enrichment terms for differentially expressed intersection mRNAs. GO analysis of the common differentially expressed mRNAs was performed. KEGG systematically interprets sequence data by computerizing biochemical pathways and other types of molecular interactions[36-38]. The results showed that the most highly enriched pathway was ‘transcriptional misregulation in cancer’ (Table 2). The genes in ‘transcriptional misregulation in cancer’ pathway were TCF3, CXCL8, SIX1, IGFBP3, MLF1, PLAU, MEIS1, HOXA10, MMP9, SIX4, HPGD, and MMP3. The second most highly enriched pathway was ‘ECM-receptor interaction’ (Figure 4). The genes in ‘ECM-receptor interaction’ pathway were ITGB4, COL1A1, COL11A1, ITGA3, LAMC2, SPP1, LAMB3, and IBSP. Table 2 mRNA pathway analysis in oesophageal squamous cell carcinoma. 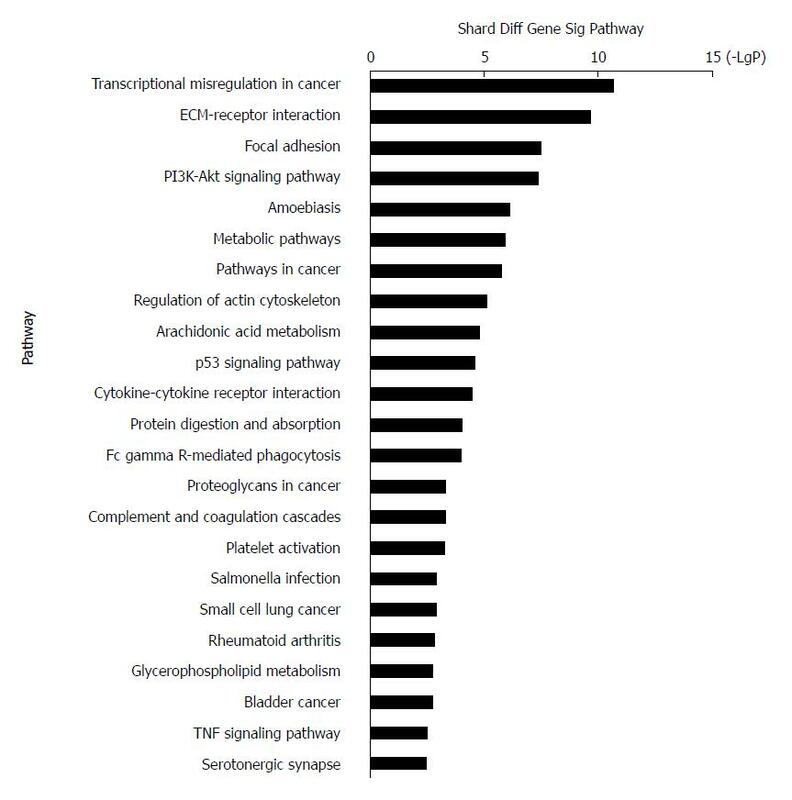 Figure 4 Top 23 pathway enrichment terms for differentially expressed intersection mRNAs. KEGG pathway analysis of the common differentially expressed mRNAs was performed. Protein-protein interactions have been not only direct binding, but also indirect actions. Genomic associations between protein-coding genes are provided for interring functional links between proteins. Genes that have the same function are often located in close to each other and tend to participate in gene-fusion events[40-42]. The database STRING has been used to analyse these associations. We input the shared differential mRNAs from GSE45670, GSE26886, and GSE17351 into the STRING database. Several nodes with high degrees were COL27A1, COL7A1, COL1A1, ITGB4, ITGA3, SERPINE1, MMP1, MMP9, and MMP10 (Figure 5). 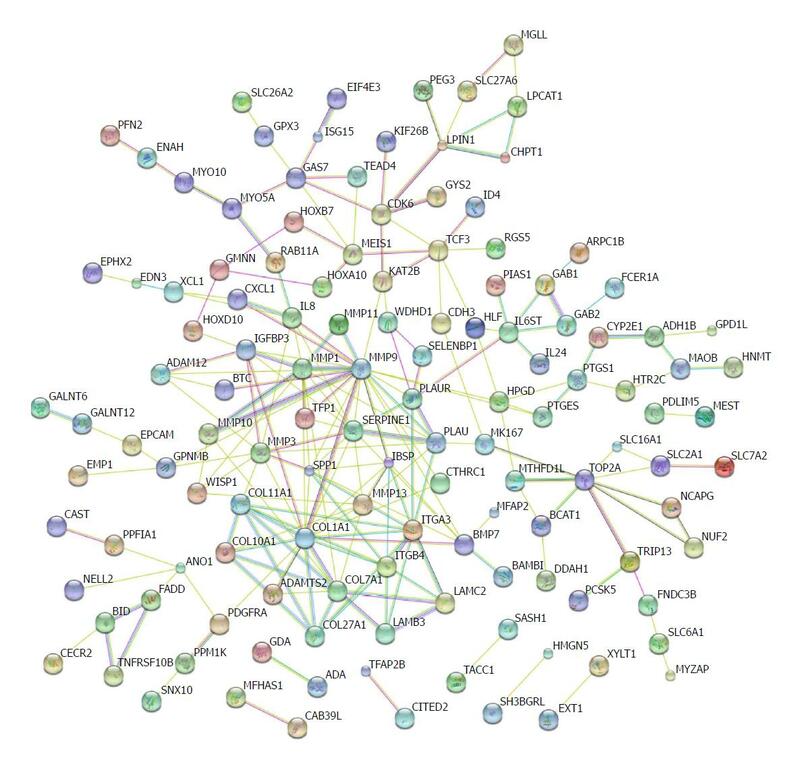 Figure 5 Protein regulation network analysis. The protein-protein interaction networks were constructed by Cytoscape Software. Proteins are represented with colour nodes, and interactions are represented with edges. CeRNAs share common MRE and hence regulate RNA transcripts by competitively binding with general miRNA molecules. CeRNAs could be relieved from miRNA-mediated repression and their expression levels could be positively modulated. The discovery of ceRNAs provides many implications for cancer, which have already been extensively discussed. 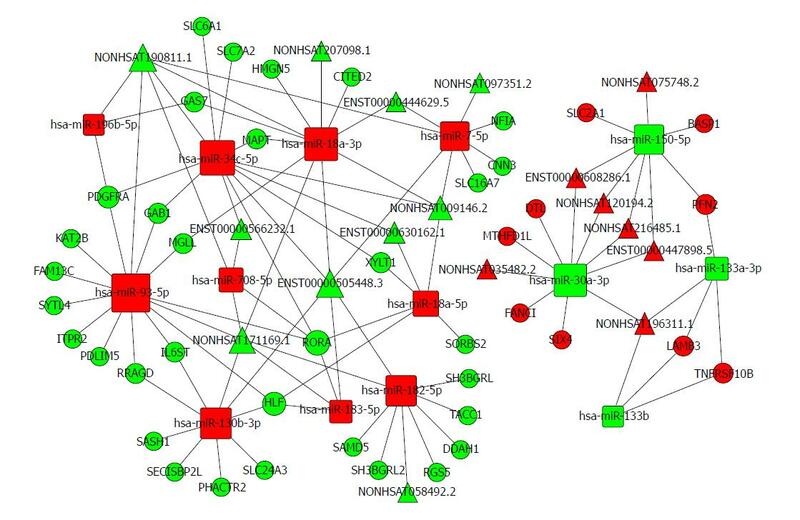 Based on the expression profiles of specific miRNAs, lncRNAs, and mRNAs in patients with oesophageal cancer, a ceRNA network was constructed using a computational method proposed for this study (Figure 6) and it was drawn with Cytoscape 3.0. The ceRNA network has integrated the miRNA-lncRNA-mRNA interactions by negative regulation. Figure 6 The lncRNA-miRNA-mRNA ceRNA network. The rectangles indicate miRNAs and circles represent mRNAs. The red indicates up-regulation and green indicates down-regulation. There are 74 nodes in the oesophageal cancer-specific ceRNA network. The degrees of the hsa-miR-93-5p, hsa-miR-34c-5p, and hsa-miR-18a-3p nodes were 14, 12, and 11, respectively. The density of our ceRNA network was confirmed with the high degree of nodes, suggesting common competitions among RNAs for oesophageal cancer. The modes degree was also observed to follow power law distribution. For miRNAs, the expression of hsa-miR-196b-5p, has-miR-34c-5p, and has-miR-18a-3p were up-regulated. However, the expression levels were down-regulated for has-miR-30a-3p, has-miR-150-5p, and has-miR-133a-3p. All these analysis results suggest the scale-free ceRNA network in oesophageal cancer and the biological significance may be reflected by the topological structures including the hubs, nodes, and communities. 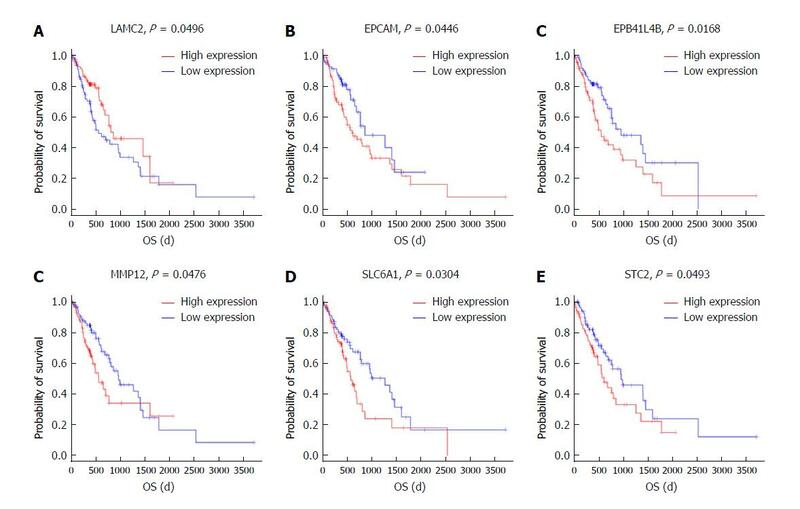 To further identify the key mRNAs that were associated with prognostic characteristics in 170 ESCC patients, the overall survival was profiled with the univariate Cox proportional hazards regression model (P < 0.05). Among the six significant mRNAs, the overall survival was negatively related to five mRNA transcripts (STC2, SLC6A1, MMP12, EPCAM, and EPB411L4B) (P < 0.05) while positively associated with the remaining mRNA transcript (LAMC2) (P < 0.05) (Figure 7A-F). Figure 7 Kaplan-Meier survival curves for eight mRNAs associated with overall survival. Log-rank tests were performed to evaluate the survival differences between the two curves. Horizontal axis: Overall survival time, days; Vertical axis: Survival function. It is necessary to explore ceRNA cross-talk across multiple cancer types. TCGA was formed to meet these needs and its vast data sets provide us with an unprecedented opportunity to systematically analyse the ceRNA network in cancer. These interesting findings led us to construct an oesophageal cancer-specific ceRNA network. In this work, clustering analysis, mRNA GO analysis, mRNA pathway analysis, and protein regulation network analysis in ESCC were conducted to construct the ceRNA network. The results showed that the most highly enriched GO path was ‘extracellular matrix organization’. The genes in ‘extracellular matrix organization’ path were MMP3, MMP10, LAMA3, MMP9, MMP13, COL11A1, BMP7, MMP12, LAMC2, COL27A1, ITGB4, PDGFRA, ADAMTS2, IBSP, COL10A1, COL7A1, MMP11, MFAP2, MMP1, and COL1A1. Advances in structural genomics will make it possible to reveal the complete genome sequence of hundreds of organisms. The ceRNA network analysis indicated that the degree of has-miR-93-5p as an up-regulated gene was 14. All these results are relevant to the further development of treatments for oesophageal cancer. Based on Kaplan-Meier analysis, overall survival was negatively related to five mRNA transcripts (STC2, SLC6A1, MMP12, EPCAM, and EPB41L4B) (P < 0.05) and it was positively associated with the remaining mRNA transcript (LAMC2) (P < 0.05). These mRNAs could be candidate and specific biomarkers for the diagnosis, prognosis, and classification of ESCC. In this research, a computational approach has been proposed for the construction of ceRNA network based on existing data of esophageal cancer. In this network, the junction nodes indicate paired gene pair in competing mRNA library. We observed that the ESCC-specific ceRNA network is scale-free, and the dense clusters in the network are associated with promising markers. The results of mRNA pathway analysis showed that the most highly enriched pathway was transcriptional misregulation in cancer. In addition, overall survival was negatively related to the genes STC2, SLC6A1, MMP12, EPCAM, and EPB41L4B, while it was positively associated with LAMC2. These confirmed results suggested that the biological mechanism of ESCC could be discovered with the constructed ceRNA network. Importantly, a simple framework has been provided in our work for the construction of a ceRNA network, which can be used to a variety of biological issues, such as ESCC and its biological processes. In short, cancer-specific miRNAs, lncRNAs, and mRNAs in ESCC can be successfully identified in the present study by bioinformatics analysis from large scale samples. Moreover, understanding the ceRNA network in ESCC may reveal potential intended targets for cancer sub-populations or across cancers. This work suggests new approaches for studying the role and mechanism of ceRNAs in human cancers using publicly available genomic data.